If you are looking for something fun to do to help break up the monotony of winter, the Women of Bedford United have just the answer! The organization will be hosting their 23rd annual High Tea on Saturday, February 25 from 11 a.m. to 3 p.m. at LaRoy’s Hall, located at 12375 Telegraph Rd. in LaSalle. For the price of a ticket you can enjoy an afternoon of tea, food, fashion, entertainment, shopping and fun. What would make the day even more fun is if you invite a best friend or family mem­ber to share all of the events of the High Tea with you! 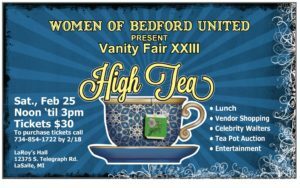 In addition to a delicious luncheon and of course tea, the Women of Bedford United have been working hard to pro-vide a lineup of events during the High Tea that everyone will enjoy. “Models will be modeling fashions by LuLaRoe, there will be celebrity waiters, prizes for hats, door prizes and there will be photos again this year taken when the guests come in all dressed up,” said Meg Smith, an organizer of the High Tea. Over the past 22 years, an attendee favorite is the teapot auction. Each celeb­rity waiter brings a teapot to be auctioned. Before the bidding begins, the waiter has to tell what makes his teapot so ex­traordinary. The tales that they tell are hilarious and very entertaining. Vendors will have some unique items for sale for a little treat for you or maybe to purchase as a gift for an upcoming birthday or special occasion for a family member or friend. Women of Bedford United member Tammy Lamb has selected some excep­tional vendors for this year’s tea that will each have something different for sale. “We will have LuLaRoe by Debbie Perry, Purse Love, Country Candles by Carrie, Just Dazzle, Designs & Dabbles, Mary Kay and Cards by Stefanie,” she said. This year High Tea organizers have come up with some new things that will take place during the tea. “We’ve added a couple of different things this year that should be exciting,” Smith said. The Women of Bedford United have a fund that they have created with a goal of assisting families in the Bedford community. Proceeds from the High Tea provide funding for this assistance through the Bedford Community Foundation. “We were able to help a family this year get into their first house, so the fund is working,” Smith said. 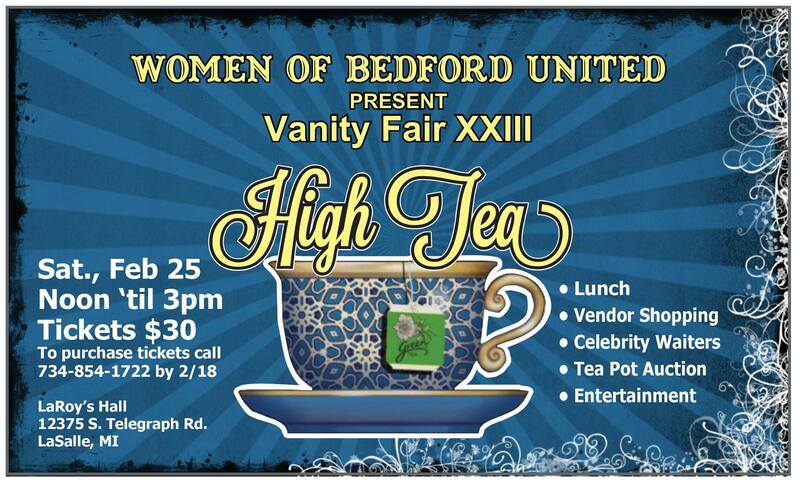 Make plans to attend the 23rd an­nual Women of Bedford United High Tea and get your tickets now so that you don’t miss out on this fun event. Tickets are priced at $30 per person and can be purchased from any Women of Bedford United member, Laura Collins at Collins Accounting & Tax Service, 3352 Dean Rd. in Lambertville, (734) 854-2926 or Karen Daggett at (419) 290-6846.